John Dreyfuss’ latest installation, of a deconstructed submarine rising to the shallows, is deep. That’s because a submarine represents a range of human emotions, particularly the kind that don’t bring out the best in us: paranoia, anxiety, claustrophobia, aggression, stealthy might. 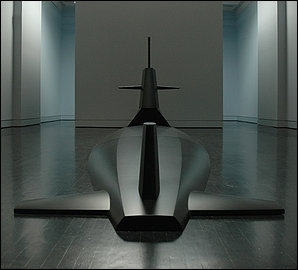 In his exhibition at Hemphill, Dreyfuss has installed the parts of a submarine emerging from the gallery floor and walls—a sea of black floor with the hulking black metal atop. But even though war comes to mind first, the submarine isn’t just about aggression—it’s also about beauty. The metallic hull is as smooth as placid water, and the silhouette of a fin against the gallery walls is striking. “Enigma” is intriguing: What more lies beneath this surface?